I can let you hook up at garage for electric but will need to fill fresh water tank. My new gravel driveway. Notice silver culvert in ditch. I am 5 miles off I 24. Back in or pull in. But No turn around. 28 miles from Downtown Nashville. Lots of hiking, kayaking, biking here in Mid Tn. Leave NO Trace ! Pack it in Pack it out. We’re Quite Folks. This is a residential neighborhood, I have neighbors. There is a Good Sam Camp Park <8 miles from my house to empty your tanks. She charges me $10.00. 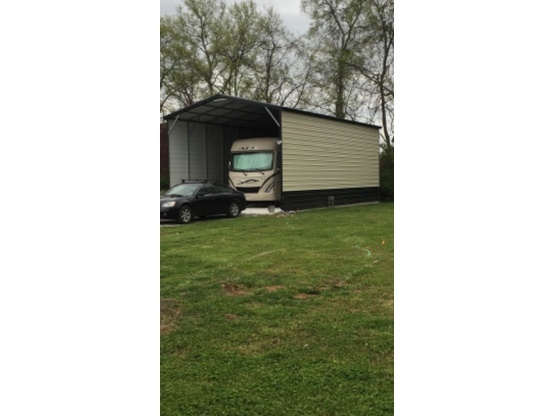 You need to be good at backing your rig over my 12' wide driveway. Ditch on both sides. Paved roads to my home. I back my 30’ Motorhome into my yard over a culvert 12’. Nashville tourist , Lakes, creeks, Mountains, Greenaway for biking. Opry Mills shopping, Grand Ole Opry. Our hosts couldn't be home but let us their home for 2 nights. Thanks so much for hosting us. 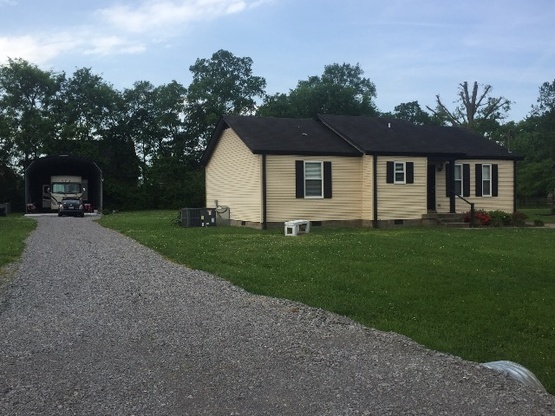 We stayed with Shay and Gary for 3 nights in their place about 35 mins outside of downtown Nashville. The drive was easy enough to back into, quiet, flat and strong wifi. We were able to find parking in the city for $5 at Nissan Stadium and spent a day exploring the shops and bar hopping listening to live music. Had a lovely chat with the pair over coffee one morning. Would recommend! I stayed for three days to work in my camper. There is a new Publix grocery store in town. The neighborhood is very quiet and the host kindly provided a household electrical connection. We greatly enjoyed our stay with Shay! She is a wonderful host, and we enjoyed hearing about her travels, and things to see and do in the area and getting to visit for a while. She was generous to allow us to hook up to utilities, and we enjoyed visiting Nashville and this was a great location to do that. We hope our paths cross again! Nice site for a quick stop en route from Natchez to Nashville via the superb Natchez trace route. We didn’t really had time to chat but nice guest and site. Thank you. We had a great stay at Gypsy Rest! Shay was a sweet host that was so understanding with us coming in a bit late. We hope we meet each other again on the road down the line. Thanks all your help! We had a great stop at Gypsy Rest. Very accommodating host who was busy and away for work when we arrived but provided all the details for us find and get settled at her host site. She also provided great tips on exploring the local area as well as services in the local area. We had a nice 2-day stay which gave us the opportunity to explore Nashville and enjoy the local country music scene, with highlight being able to get into and see a show at the "Bluebird Cafe". On our morning of departure we had a nice visit w/ Shea and exchanged camping traveling adventures and tips. If we are ever back in the area would love stay at this BDW host site again, as well we hope to host Shea at our site if she ever gets north to our area! Happy travels Shea, and thanks for being a 5* BDW host! We were able to back in, hook up and “hole-up.” The weather was very cold and rainy. We stayed for two nights and enjoyed Sharon’s recommendation for a great restaurant. I believe that this was our first Boondockers experience and we are so very impressed. We are in the third month of our seven month Road Trip and have not even bothered to make reservations most of the time. Thanks, Sharon and Boondockers!!!! Nice beautiful area and quiet. The host was away but the site was great for some much needed rest. Thanks again! Very nice and welcoming. Very responsive to messages. Quiet neighborhood close to everything you might need. Not a tough spot to get into. Would definitely go back. Great host, very accommodating and helpful tips on the area. Very safe & quiet residential area. Thoroughly enjoyed our stay at gypsyrest and would highly recommend! Must be able to back your rig, the driveway is plenty wide but a very severe drop off if you miss as mentioned in the host site information. Really enjoyed my stay here. I was in and out visiting friends. Super quiet and peaceful. Absolutely recommend!